"Bajans" redirects here. For other uses, see Bajan. 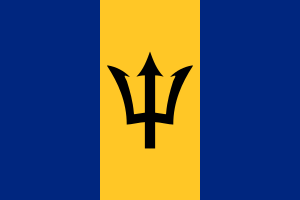 Barbadians, or Bajans, are the people who are identified with the country of Barbados, be it the citizens of the country or their descendants in the Barbadian diaspora. This connection may be residential, legal, historical, or cultural. For most Barbadians, several (or all) of these connections exist and are collectively the source of their identity. Barbadians are a multi-ethnic and multicultural society of various different ethnic, religious and national origins. Many Barbadians now live overseas and outside of Barbados; the majority have migrated to Anglophone countries, including 37,780 Barbadians in Canada, some 19,000 in the United Kingdom, around 65,000 in the United States and some 500–1,000 Barbadians in Liberia. In addition to Anglophone countries other groups of Barbadians have moved to Latin countries including: Brazil, Cuba and Panama. ^ "The World Factbook: Barbados". cia.gov. Central Intelligence Agency. Retrieved 5 July 2015. ^ Statistics Canada. "Census Profile, 2016 Census". Retrieved 25 June 2018. ^ "Country-of-birth database". Organisation for Economic Co-operation and Development. Archived from the original on 17 June 2009. Retrieved 3 June 2009. ^ "Chamberlain, M.: Migration and Post-Colonialism: the Commonwealth Caribbean, 2008". Archived from the original on 13 September 2012. Retrieved 6 November 2012. ^ ‘LONG LOST’ BAJANS IN PANAMA – LOOKING FOR FAMILY IN BARBADOS, CAN YOU HELP?